The all-rounder's performances in testing conditions must have impressed the team-management. 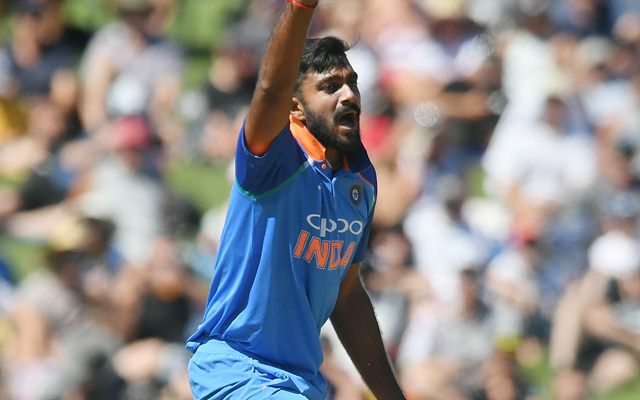 Team India sprung a big surprise while chasing a mammoth 213 in the third and final T20I against New Zealand by promoting all-rounder Vijay Shankar at number three. While Shankar was definitely in good form in the first two games of the series, nobody was expecting him to bat at number three especially when the asking run-rate was over ten. And not only the fans and pundits but even Shankar was taken aback with the team management’s decision. But Shankar once again impressed with the bat as he justified the decision by top-scoring for the visitors. India were in dire need of some big shots after losing Shikhar Dhawan in the very first over and Shankar did exactly that. He hit five boundaries and two sixes in quick time and raced away to 43 off just 28 before being sent back by Mitchell Santner. Shankar’s 43 went on to be the highest score from the Indian camp as the hosts won the game by 4 runs to seal the series 2-1. Chasing 213, India gave New Zealand a tough fight till the end but eventually managed to score 208 for 6. The visitors needed an improbable 16 off the final over but Dinesh Karthik and Krunal Pandya managed to score just 11. Speaking at the end of the game, the 28-year-old Shankar admitted that the team management’s decision to promote him left him surprised. “It was a big surprise for me when they asked me to bat at three. That is a big thing. I was focussed on playing the situation. You need to be open anyway if you are playing for a team like India,” Shankar was quoted as saying in the post-match press conference. The highly-rated all-rounder said that the tour of Australia and New Zealand have helped him learn a lot as a cricketer. Shankar was a late inclusion to the squads after KL Rahul and Hardik Pandya were sent back home following the Koffee with Karan fiasco. He made his ODI debut against Australia in Melbourne and featured in three out of five ODIs and all three T20s against New Zealand. The all-rounder’s performances in testing conditions must have impressed the team-management. “These (Australia and New Zealand) two series I have learnt a lot. I might not have bowled a lot, but I learnt to bowl in different conditions. In batting, just watching seniors like Virat Kohli, Rohit Sharma, and MS Dhoni, how they go about their job, I learnt a lot,” he mentioned.